You can access the HiveServer Interactive UI in Ambari to monitor and display heap, system, and cache metrics of each Hive LLAP node. You installed Hive using Ambari and Hive is running. You enabled LLAP in the cluster. In this task you open the HiveServer Interactive UI and view executing queries in real time or a recent history of queries. From the UI, you can also access running LLAP daemons. 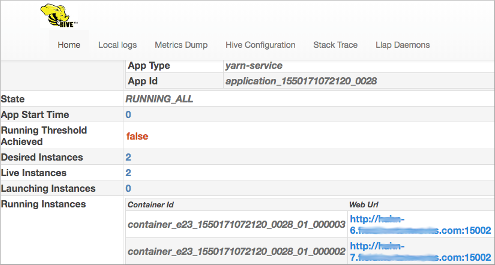 In Ambari, select Services > Hive > Summaryand in Quick Links, click HiveServer Interactive UI. The HiveServer Interactive UI shows LLAP running on two daemons (instances). A list of HiveServer Interactive logs appears. The logged data from /var/log/hive/hiveserver2Interactive, which you can use for troubleshooting HiveServer Interactive problems, appears. The logged data about queries, which includes query and task execution summaries, appears.